Self-service food areas, like the roller grill, require constant attention to keep clean. 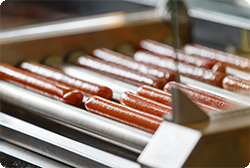 In this online training two-module workshop, employees receive detailed instruction for prepping and cleaning the roller grill, sanitizing tongs, checking the sneeze guard and flavor tags, and removing dated products. Employees will learn the specific procedures to ensure the store is following food safety guidelines.